alaTest has collected and analyzed 725 reviews of Zoostorm Mini Tower / i5-3330 / 8GB. The average rating for this product is 4.3/5, compared to an average rating of 4.1/5 for other Desktops for all reviews. People are impressed by the design and reliability. The usability and price also get good feedback. There are some mixed opinions about the size. We analyzed user and expert ratings, product age and more factors. 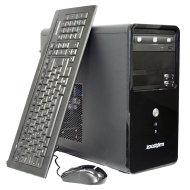 Compared to other Desktops the Zoostorm Mini Tower / i5-3330 / 8GB is awarded an overall alaScore™ of 85/100 = Very good quality. Good value for the specification. I know a number of people who have this brand and they have all been very satisfied. 12 gig of ram and a mega processor means this is a beast! What is with the PSU?! It's so loud it almost sounds broken!! Thankfully my old Zoostorm PSU is quieter so I'll swap them around! Great value, decent specification, noticeably cheaper than any comparable brands. On the surface, a well specced machine, with good processor, RAM and disk capacities. No memory card slots, no firewire, ridiculously noisy power supply, flimsy case, difficult to remove expansion slot blanks.